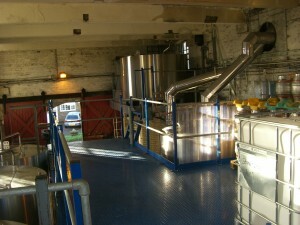 Stonehenge Ales Ltd in Salisbury, Wiltshire needed to create some additional storage areas and the only space available in the 1920s listed old mill building was around and above the hopper tanks brewing the beer. Hampshire Mezzanine was asked along with three other companies to submit concepts and budget plans. 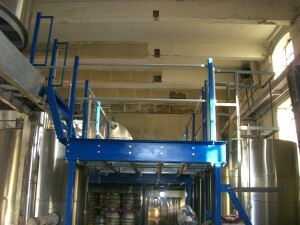 The solution chosen by Stonehenge Ales was the HMF steel decked heavy duty storage platform with both satisfied their storage requirements and the ability to create a work platform where they test the beer during production. The mezzanine floor was prefabricated and delivered to site in kit form and erected in only two days. Perimeter hand and knee rail with steel kick plates was also installed to all perimeter areas with a hinged gate fitted to allow access for the one tonne finished beer. Additional works also included a raked ladder with hand railing to safely access a higher existing platform. The works were installed during normal hours, working around the customer’s production requirements. Stig Anderson, Owner, was very pleased with the installation and how smooth the process was. He even tipped the mezzanine installers with a taster of his famous ale, which was most appreciated by the installation team. 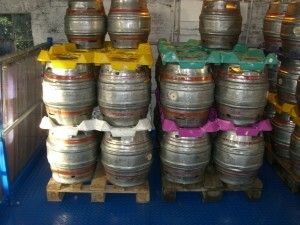 The traditional working space will enable Stonehenge Ales to further increase their business ambitions of growing the famous Stonehenge Ales Ltd in the future. In many ways, the service from Hampshire Mezzanine Floors was much like a fine pint of Stonehenge Ale, strong and reliable with a good finish!